Mike, the Director of Marketing for Biblica, reminded me recently that until recently, Operation World was only available as a traditional book, CD-ROM, or DVD. Now — suddenly — it’s ready to download immediately, in just about every format imaginable. 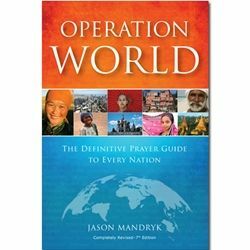 For more than 40 years, Operation World has been the primary global resource encouraging readers to pray for world missions and evangelism. Since the original edition as printed in 1974, more than 2.5 million copies have been sold in a variety of languages. The book has been translated into German, Spanish, Portuguese, French, Korean, Chinese, Russian, and in part into Indonesian and Italian. It’s my go-to book, the one I open during prayer times (when I’m sure people think at first that I’m checking my email), and the one you’ll go to again and again. No kickbacks, no marketing fees, no fooling — this book is the real deal. Can you imagine 10,000 files on one resource DVD? I’ve started just leaving it in the DVD slot on my laptop. It’s the *primary* reason I won’t drop down to a lighter notebook that sacrifices an onboard DVD player. Not only do you have the complete text of the book (over 1000 pages), you’ve also got 2 hours of video (including a 66′ minute presentation by Op. World author, Jason Mandryk, explaining the state of the Gospel. Just as gripping, there’s a 26′ interview between Jason and Patrick Johnstone, the “Father of Operation World.” On top of all that, you get an introductory PowerPoint presentation, flag graphic and handout for each of the 231 countries of the world (965 slides in all), plus about 500 maps, nearly 1000 charts, and all the Operation World data sets. Imagine — years of research in your disk drive! I don’t think there’s ever been any product like this in the history of the world. There’s also a global Mission Agency Directory (and they even mention Brigada on page 951!!!) plus the capability of building custom maps and charts in the years to come. So I ask you — can you now understand why $29.99 is an incredible price, seeing as how the typical global atlas for your coffee table might run you $150. And this one doesn’t even get dusty!!! Hats off to Jason, the entire OW crew, plus Global Mapping — for bringing technology to us at a bargain price. And here’s the most amazing thing of all: It’s so simple, you will probably be able to use it on any computer (Mac or PC) without even running the install file. Amazing. Thanks guys. That’s where the Operation World folks give you a teaser of some of the information you’ll find in the latest edition of the earthshaking volume. And honestly, they’ve given quite a lot of information for free. If nothing else, that level of nobility ought to convict all of us to go out and buy the book. Well done Jason & company! Last night, I was able to attend a reception here at Lausanne III. The reception celebrated the launching of Operation World. The new 2010 edition features…. Get the DVD, the CDRom, the wall map, and/or the newly-refreshed old-fashioned book. The DVD version will come with a cool feature through which you can “build your own map!” Cool. to learn about and buy the CD or DVD, and enter “Brigada” in the comments box at the bottom of the Check Out form. Imagine if 5, 10 or 100 Brigada participants were to order a DVD. They’d be getting the latest mobilization info *and* helping Brigada all at once! However, better act fact. If you’re delayed even 8 days, your purchase won’t help Brigada in the least (directly). Thanks for your rapid response on this! Get the DVD, the CDRom, the wall map, or the old-fashioned book. It really doesn’t matter. Whatever you get will be chalked full of new knowledge for which we’re all hungry. You can even get the map in a format good for dry-erase markers. (You can tell your mom and dad that you’ve finally made your mark on the world!) And the DVD version will come with a cool feature through which you can “build your own map!” I love it. Walk — don’t run — to gmi.org to pre-order today. This translation is from the latest version, revised in 2005. 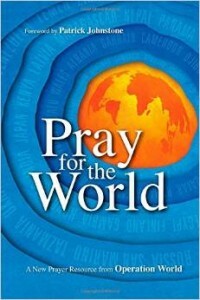 (A team has just begun on translating the new 2010 edition, but it will probably not be out until late 2011.) You can get copies of this 2005 edition for the actual cost of printing/shipping to you. But you must order a full case of 20. The price is $4 per book or $80 per case, including shipping in the continental U.S. The print edition is available as well.